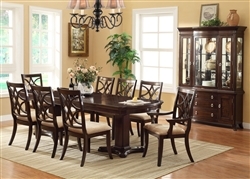 The Katherine Dining Collection by Crown Mark is made of birch solids and ash burl Veneers in a dark cherry finish. This group presents transitional style with gentle curves and elegant shapes. 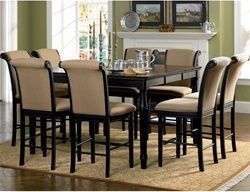 The Double Pedestal Table includes two 18 inch extension leaves, creating more space for larger gatherings. This Rich 2 tone Cappuccino Counter Height 9 Piece Dining Set by Coaster includes a table and eight bar stools in rich cappuccino finish and amaretto color table top. The table features very functional and useful extension leaf which extends the length up to 60''. The Al Fresco Casual Dining Collection by Liberty Furniture features a blend of cottage styling with country accented details. This group is made with Rubberwood Solids and Pin Knotty Oak Veneers. The Black Finish is given a classy edge by the sleek Driftwood finish of the top that makes this piece timeless in its beauty. To know all about the casino just try it. This site will give you all possibilities for playing. It is available for everyone. Just click the link and read the rules. Don't doubt, the game is on!